In her new book, which builds on the investigation of aesthetics and minor affects she began in 2005’s Ugly Feelings, Ngai, a professor at Stanford University, encourages us to look beyond traditional aesthetic categories like “beautiful” or “sublime,” terms still in heavy rotation in academic contexts, to the colloquial words the twentieth and twenty-first centuries use to talk about art, especially (though not exclusively) in the American context. In this case, the terms under discussion are “zany,” “cute,” and “interesting.” Ngai wants to know what we can learn about contemporary responses to art by attending to categories “marginal” to traditional aesthetic theory and what we can learn about culture by looking at the lexicon we use to describe it. Among such a welter of words, Ngai’s selection of the cute, the interesting, and the zany might seem arbitrary and insignificant. But what this book does so well is convince us that, of the staggering array of verbiage we’ve developed for tracking styles of art and our responses to them, these unassuming, conversational words are some of those that speak most directly to “everyday practices of production, circulation, and consumption.” They are “the [terms] in our current repertoire best suited for grasping how aesthetic experience has been transformed by the hypercommodified, information-saturated, performance-driven conditions of late capitalism.” That is, Ngai is concerned with how art matters. If you buy her conviction that the way we talk about our response to art can tell us a lot about important non-aesthetic features of our culture — how we use and process information, how we labor, how we play, and how we trade, buy, and sell — then her choice of categories comes into focus. In order to talk about how the aesthetic and the non-aesthetic inform one another, we need to think about the kinds of aesthetic judgments that happen alongside the daily practices of working, consuming, and exchanging, the kind of judgments that, because we make them lightly, socially, frequently, often pass unnoticed. Although we might use the word “cute” often, calling someone or something “cute” doesn’t always explicitly signal that the conversation has entered the realm of art in the same way that the word “painterly” or “sublime” might. But Ngai argues that this is precisely why we need to pay attention to these stealthy aesthetic words. For instance, despite the ubiquity of “cuteness” as a style and a speech act, it is still, she contends, a statement of taste, and its use implies an aesthetic dimension. In choosing to work with aesthetic categories that don’t always mark themselves as aesthetic, Ngai shows us how deeply our daily lives are interpenetrated with taste — aesthetic ways of feeling and judging the world. For Ngai, an aesthetic judgment always begins with feeling, the fine gradations of affect inspired by an encounter with a photograph or a line of poetry that we may later justify through intellect. If nothing else, Ngai’s attention to the cute, the interesting, and the zany (she devotes a longish chapter to each), encourages us to concentrate on how everyday emotions can become the beginnings of aesthetic judgment. A feeling of undifferentiated pleasure might, for example, give rise to a judgment like “beautiful” or “elegant.” Displeasure, meanwhile, might cause us to think “how ugly!” Ngai’s categories rely on affective responses we often experience as negative, weak, or muddy — a diluted form of wonder in the case of the interesting, suspicion and vicarious exhaustion in the case of the zany; in the case of the cute, mingled protectiveness, aggression, and disgust. I was alert, as I read Our Aesthetic Categories, to any casual use of “zany,” “cute,” or “interesting.” I became attuned to them, in the way one does after learning the meaning of a new word. Suddenly, they seemed to be everywhere, these judgments of trivial and conflicted feeling. This speaks, perhaps, to Ngai’s prescience, but also (it is not an entirely comfortable thought) to what may be a contemporary cultural penchant for dealing with complex emotions by funneling them through the seemingly mild vocabulary of our communal aesthetic language. Everything was cute: cat macros, anthropomorphic comets, baby carrots. Everything was interesting: bioluminescent fungi, Sheila Heti, The Clock. Ngai’s final category was somewhat more elusive until a friend described one of Yayoi Kusama’s corybantically polka-dotted surfaces as zany. If it’s true that we launder our emotions (as money is laundered) through aesthetic judgments like these, disguising our messy, unpredictable feelings in words that enter the shared discourse cleanly and unobtrusively, it’s also true that these apparently clean, unobtrusive words may be able to help us analyze the tangled sentiments they mask. Ngai centers her argument on the judgments of taste we make in everyday speech. Our Aesthetic Categories is as much about the process of arriving at verdicts like “cute,” “zany,” and “interesting” as it is about the stylistic conventions that inspire us to make those judgments. Ngai is particularly interested in how these judgments are part of ordinary public discourse. Judgments of taste, she reminds us, are “ways of relating to other subjects and the larger social arrangements these ways of relating presuppose.” That is, aesthetic judgments are always, to a degree, about the impulse to share what we feel and then to justify it. Book reviews, for example (and this one is no exception), are a byproduct of the compulsion to aesthetic evaluation. They are always a social phenomenon in the way they ask both writers and readers to enter into a communal relationship and help to establish the subject of the review in a wider network of “social arrangements.” Readers often look to reviews because we want to know how our impressions of any given work compare with the impressions of others, how the work “acts” to form a society of perspectives. Usually, we also want to know whether a book is worth our time, how to value it, whether it’s good. By this, we often mean something like “will it be to my taste?” We want, in short, some kind of aesthetic judgment. This is not to say that reviews might not make, or readers ask for, other sorts of judgments (moral judgments, for example). It’s not even to say that taste-based judgments can’t coexist with other kinds of judgments. In fact, they usually do. When it comes to art, for example, evaluations like “good” and “bad” are almost always aesthetic evaluations rather than moral ones, though they are often connected to (and sometimes depend upon) evaluations of the artwork’s ethical or political commitments. This is merely to point out two facts that, however unremarkable, are too often overlooked in critical circles: 1) Aesthetic experience is merely one among many types of experience. 2) Aesthetic experience is attached, in some way, to our nonaesthetic encounters with the world. A reader’s assessment of how the taste of a reviewer is configured — what kinds of history or ideas seem to have shaped it, whether it matches up to the reader’s own feelings and experience — informs her assessment of how reviewer and book connect to the larger reading community. To judge something “good” or “bad” is to participate in a bigger conversation about what kinds of aesthetic choices are culturally valid. Consider, for instance, the recent debates about the decline of the book review. See Jacob Silverman’s recent Slate piece on the necessity of negative reviews or Laura Miller’s rebuttal in Salon. The complaint, on both sides, is that criticism is using feeling in the wrong way. Silverman decries the “cloying niceness” of review culture while Miller cautions against the “vast reservoirs of bile” that animate the most acrimonious reviews. If, as Our Aesthetic Categories argues, aesthetic judgments are also feeling-based judgments, then this conversation about feeling in reviews is also a conversation about judgments based on feeling — the relationship of aesthetic judgments to value judgments. Ngai’s take on how we arrive at aesthetic evaluations is a helpful complement to that dialogue about what we should expect a critic to feel and do: “[T]he old idea that the task of criticism is to produce verdicts of artistic greatness versus mediocrity” is, she argues, pretty limiting. The notion that criticism ought to avoid feeling-based evaluations entirely is equally narrow. Here I will pause to make my own judgment: if you are at all interested in how we respond to the artifacts of culture, Our Aesthetic Categories is ravishingly, passionately, resonantly useful. You should pay attention. This is why. In the chapter titled “The Cuteness of the Avant-Garde,” Ngai lays out a series of initially startling and ultimately convincing arguments: she claims that the avant-garde, and particularly avant-garde poetry, has engaged with the forms and the language of cuteness in a way that underscores the modern identification of poetry with smallness, domesticity, eroticism, and vulnerability. It’s a surprising argument because the avant-garde is often conceived of in terms that, like plans for a Futurist train station, emphasize austerity and keen, cold surfaces with little give. In Ngai’s avant-garde, however, there is a “pliancy or responsiveness to the will of others,” a “cuteness” just as unsettling, in its way, as the chilly, thrusting excesses of a Sant’Elia or a Marinetti. (Even the etymology of “cute” sheds light on how the category eerily performs its own nebulousness and malleability: “cute,” a mid-nineteenth century coinage, is, as Ngai points out, a shortened or cutified version of “acute,” so that the word itself is, in essence, a thing shorn of angles.). With its enormous face (it is in fact nothing but face) and exaggerated gaze (but interestingly no mouth), the bath toy underscores the centrality of anthropomorphism to cuteness. Yet what is striking is how crudely simplified the sponge’s features are, as if cuteness were a commercial as opposed to high-modernist primitivism. Realist verisimilitude and formal precision tend to work against or even nullify cuteness, which becomes most pronounced in objects with simple round contours and little or no ornamentation or details. By this logic, the epitome of the cute would be an undifferentiated blob of soft doughy matter. Since cuteness is an aestheticization of powerlessness (“what we love because it submits to us”) [. . .] the less formally articulated the commodity, the cuter. The bath sponge makes this especially clear because its purpose is to be pressed against a baby’s body and squished in a way guaranteed to repeatedly crush and deform its somewhat formless face. Ngai positions cuteness as a particular kind of affective response to a lack of agency — in order to judge something cute you first have to feel your own dominance in relation to it. This dominance may take the form of a desire to protect the cute object, as a parent might, or, more darkly, the desire to exert power by hurting or destroying it. These conflicting drives combine to produce an aesthetic category with strong ties to the childish, the domestic, the sexual, and historical ideas about feminine weakness. A recent news item on the Japanese city of Fukuoka’s establishment of an official “cute (kawaii) ward” put me in mind of Ngai’s claims. The purpose of the ward is to publicize, as one account puts it, the municipality’s “cute assets and cute culture,” which might be either a cynical embrace of the more ominous overtones of the cute or else a slyly subversive way of speaking truth to powerlessness. Apart from Ngai’s rather puzzling characterization of lyric as a subgenre (if anything, it has become in the twentieth and twenty-first centuries, a supergenre, almost a pure synonym for poetry), this passage offers up, through its assembly of little, poetic objects, an accretion of small but significant pieces of evidence for reading modern and contemporary poetry through the lens of its engagement with the minor, the ordinary, and the helpless. These theses may be tested by the application of your retina to photographs of baby pandas. “Interesting” is an aesthetic judgment so mild and so commonplace that it barely seems to qualify as a judgment at all. But that’s part of Ngai’s point. If interesting is, on some level, an aesthetic judgment, then its ubiquity (especially in critical contexts) stresses the “ambiguous status of aesthetic judgments in criticism,” as they “mediat[e] feelings and concepts.” “Interesting” is our gambit, Ngai contends, when we feel something but we’re not yet sure what to think. When we say something is interesting, we are inviting conversation. We want to be asked to explain ourselves. In Ngai’s paradigm, the interesting “begins with a feeling — inquisitiveness, curiosity, wonder — falling somewhere between an affect and a desire.” It’s a judgment that relies “not on an existing concept of the object but on a feeling, hard to categorize in its own right, that in spite of its indeterminacy [. . .] discerns or alerts us precisely to what we do not have a concept for (yet).” By Ngai’s lights, this conceptless feeling begs us to analyze it, to explain it rationally. In this way, the interesting “toggles between aesthetic and non-aesthetic” contexts, as if it were a switch that allowed us to move from an emotional register to a cognitive one. In “Merely Interesting,” Ngai establishes the interesting as a contemporary aesthetic category: she assembles a genealogy that stretches back to Schlegel’s definition of the modern, “subjective” literature of the “interessante,” which he contrasted to the beautiful, “objective” art (die schöne Poesie) of the Greeks. Interessante literature (Shakespeare was Schlegel’s example) was concerned with the particular, the original, the local, the new, and — as Ngai stresses — the open-ended. The major inheritors of the interessante, being, in Ngai’s reckoning, obsessed with particularity, locality, novelty, and open-endedness, are the modern novel (through Henry James’s famous dictate: “The only obligation to which in advance we may hold a novel [. . .] is that it be interesting”), cultural criticism, and the conceptual art of the 1960’s. For a linguistic example, we might think of works like Kenneth Goldsmith’s Day, in which the author “uncreatively” retypes the entirety of 2000’s Friday, September 1st edition of The New York Times; and yet, this project, entirely mechanical to all appearances, mobilizes minor emotions like boredom in unexpected ways. One strange thing about the art we call interesting is, Ngai suggests, that what’s interesting is always in danger of becoming profoundly boring. To read Day all the way through is, ostensibly, no different than reading all the way through an issue of any archived newspaper, including sports stats and stock market reports, which tend to be fairly dull when they’re no longer news. But, as we read, to think of Goldsmith sitting down to type the whole of the paper, which had to have been an immensely dull task in itself, adds another layer to the boredom — it makes the emotion of boredom visible from different angles. It validates boredom as an emotion and, moreover, as an aesthetic experience. Although Day isn’t one of her examples, it certainly could be. Ngai argues that, contrary to received wisdom, conceptual art like Goldsmith’s is not without emotion (even dryness is an affect, no matter how weak) and so still open to aesthetic (feeling-based) judgments. If we’re left cold — as many are — by conceptual art, Ngai would say that this in itself is worth attending to, that it ought to be the beginning of our aesthetic experience, not the end. Against arguments that conceptual art is an arid intellectual exercise, devoid of real feeling, Ngai sets the proposition that our thinking about feeling has not been nearly rich enough, intense enough to capture the subtle variations of affect in pieces like Ruscha’s or Goldsmith’s. Conceptual art, far from being unemotional, underscores connections “between conception and perception, idea and execution, sight and thought [,] [and] judgment and justification.” Aesthetic judgments, Ngai reminds us, are rarely ever interesting in themselves. It is, in the end, our attempts to explain why we feel what we feel that truly interest us — and one virtue of conceptual art lies in how it asks us to explain our reaction to it. In “The Zany Science,” Ngai takes up the increasingly blurry (and “politically ambiguous”) distinction between work and play. Zaniness, she contends, is “[i]ntensely affective and physical [. . .] an aesthetic of action in the presence of an audience that bridges popular and avant-garde practice across a wide range of media. If the sitcom of Lucille Ball is quintessentially zany, so also is the Dada cabaret of Hugo Ball. Walkabouts and guerilla street theater are zany, but so are the commercials of Crazy Eddie” (182). As she does with the “merely interesting,” Ngai establishes an idiosyncratic pedigree for the aesthetic category of the zany, flitting deftly (and perhaps a little zanily) from performative traditions of the Renaissance to Nietzsche’s energetically joyless Gay Science to twentieth and twenty-first century television and cinema. Ngai locates the origins of the term “zanni” in the stock characters of commedia dell’arte, sixteenth century Italian theater. The zanni was traditionally an itinerant worker “defined by a specifically nonspecific work: personal services provided in the household on a temporary basis.” Alone among her categories, Ngai notes, the zany is an aesthetic based in character, functioning sometimes as an adjective denoting a certain kind of activity and at others as a noun denoting a certain kind of person. The contemporary category of zany has developed a grammatical fluidity that matches the professional fluidity of its commedia dell’arte original. Ngai identifies the zany character with the multitude of roles s/he is able to take on and the frenetic speed with which s/he transfers from one to another. 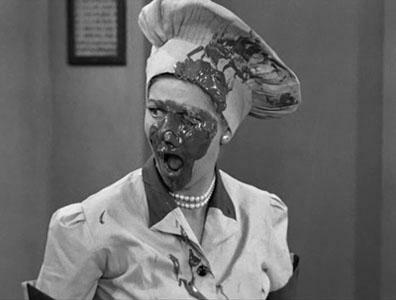 Consider, for example, Lucille Ball’s Lucy Ricardo, who, from episode to episode of I Love Lucy, transforms from ballerina to saleswoman to bellhop in “an undifferentiated, chaotic swirl.” If the zany is an aesthetic of action, it is one in which labor and play are confused so that it’s hard to tell whether we ought to react to a display of zaniness with humor or concern. “What is eating the zany?” Ngai asks. “Why is she so desperate and stressed out?” Moreover, why do we find this desperation kind of winsome? Her answer has to do with the dissolution of the boundary between leisure and work that the zany seems to enact. The “strenuous” performances of characters like Lucy Ricardo in I Love Lucy, Richard Pryor in The Toy, and Jim Carrey in The Cable Guy speak to the “precariousness created specifically by the capitalist organization of work.” That is, our own uncertainties about how work and play ought to be divided are reflected in the flexible movement of the zany from job to job, gag to gag, noun to verb. We admire and distrust this adaptability at once. We recognize it as a sort of virtuosity but, at the same time, we’re afraid of getting too near a person or a phenomenon that moves too quickly and erratically to predict. A zany might be or do anything at any given moment. When we judge something or someone to be zany, we are inevitably playing the straight man — the put-upon Ricky Ricardo to Lucy’s loopy tornado of activity, the staid Matthew Broderick to Jim Carrey’s shifty erotomania. Zaniness is wonderful at a distance; up close, it starts to seem dangerous, as if we too might become zanies, absorbed into ceaseless busyness, lost to moderation. Our Aesthetic Categories is as much about a method of doing cultural criticism as it is about its stated topics. It is a book that is, to say the least, compendious. Its model of periodization is creative — some might say messy — a fact especially evident in the chapters on the interesting and the zany, which span, respectively, three centuries and five. (Ngai can’t help but apply the judgments of “zany” and “interesting” to the process of her book’s creation. In her acknowledgments, she thanks Mark McGurl for “ten years of intellectually heady, sometimes zany, always interesting conversation about practically everything,” though she stops short at “cute.”) Along these lines, you might see the categories she’s chosen as, in their conversational ubiquity, too general and too likely to wear badly to be of service for very long. (Will we still be calling things zany in 10 years? In 20?) In a book organized around aesthetic categories, there’s no getting around how difficult it is to track these terms in a progressive, chronological way. Add to these structural challenges Ngai’s taste in examples, which range, vertiginously, from Frankfurt school theory to network television. Although these features of the book lay it open to charges of bagginess and excess, it’s to Ngai’s credit that her arguments feel inclusive and democratic rather than shapeless and disheveled. Arguably, her wide-ranging, synthetic approach is exactly the kind of criticism our ever-accreting culture deserves, and maybe even the criticism we need. By indexing the kinds of feeling-based judgments we make in our daily lives, Ngai opens up questions about how emotions can act in social contexts more generally, how our private experiences might shape our political and economic discourses. Our Aesthetic Categories attempts, on its own terms, to break down binaries it can be hard to leave behind: good culture/bad culture, beauty/sublimity, art/kitsch. If the governing obsessions of contemporary American culture are “the circulation of information, the consumption of commodities, and the becoming-labor of performance,” then we need a criticism that can speak to those obsessions, “closing the gulf between aesthetic theory and practice.” Ngai claims that the zany, the cute, and the interesting are the categories that speak best to the constitution of “a historically specific kind of aesthetic subject: ‘us.’” This claim is a powerful one, not least because it’s implicitly a challenge, and one aesthetic theory would do well to take up: are these judgments truly the ones that address our experience most directly? Or are there are any others among the “intensively variegated class” of contemporary aesthetic categories that are as encompassing — intimately ours, intimately us.